Tear the bread into evenly sized small-bite pieces over a large mixing bowl. Gently toss in the salt, garlic, onion, and dried oregano and lemon zest if using. Drizzle the oil or fat evenly over the bread and toss gently with your hands or a wooden spoon to distribute the fat. 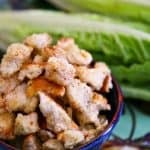 Scatter in a single, uncrowded layer on a rimmed baking sheet and bake for 15 to 20 minutes, shaking the pan every so often, until the croutons are dry to the touch and lightly golden brown in some places. Remove the pan from the oven and let the croutons cool on the pan. They will continue to crisp as they cool. Use within 3 hours, or cool completely and store at room temperature in an airtight container.